Couldn’t fit everything in your suitcase while packing for school? Want to pop some tags but only have $20 in your pocket? If you’re short on jeans, or had to leave behind your favorite sweater, you can shop around the District to load up your wardrobe. Ditch the shopping mall at Pentagon City and head to one of these boutiques for unique finds and better prices. Don’t be fooled by the unassuming brick exterior of this small shop in Georgetown — among the black and white photographs and yellow walls inside, you’ll find racks of clothes and shoes filling up almost every space of the store. According to the consignment chain’s slogan, you’ll find “new and recycled fashion,” and you can get a 10 percent student discount if you bring your GWorld card. Buffalo Exchange lets you trade in your old wardrobe for a brand new one. You can exchange clothes for store items worth 50 percent of the price on your old threads or sell them for cash worth 30 percent of the price on the spot. It’s not easy filling your closet with brand name labels on a student’s budget, so consignment shops are the next best thing to a shopping spree at Bloomingdale’s. Fia’s carries clothes, shoes and accessories from designers like Coach, Prada and Betsey Johnson. Once you step into the boutique decorated with posh-pink tapestries and chandeliers, you might even forget you’re shopping for secondhand clothes. Designer items at Fia’s can seem pricey at first, but if you hit the store basement, you won’t find anything that costs more than $10. The one-of-a-kind, vintage selection at Treasury is on the expensive side, but you can ensure that you’ll never walk into class wearing the same outfit as someone else. You don’t always have to scour secondhand shops to stock your closet and stay within your budget. With a selection of everything from business-casual blazers to jeans and flannels — all priced less than $100 — you can find something to wear to class and your internship on Capitol Hill. With its funky-patterned walls and turquoise carpet, Violet fits in with the other quirky stores lining 18th Street in Adams Morgan. In between trying on clothes, you can take a break on the white sofa and read a magazine. And if you can’t find what you’re looking for, just come back another day. 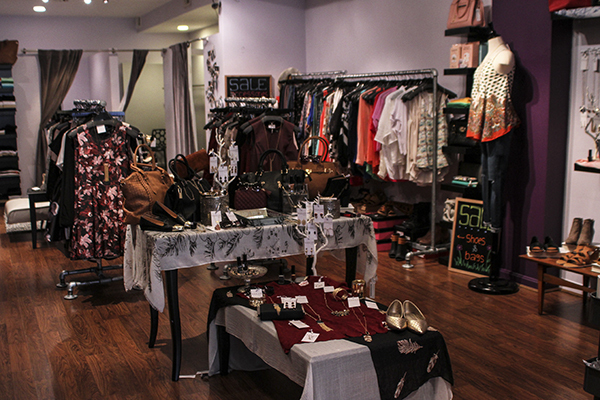 The boutique revamps its selection with new shipments every week.